PMA's Dance Program offers professional, quality instruction to students starting at age three and a half and continuing all the way into adulthood. Our classical ballet program starts with Ballet 1 classes for early elementary students and continues all the way to our pre-professional program. Students learn and perfect technique in a progressive system of training.. In addition to ballet we also offer Hip Hop, Tap, and other dance forms in our regular schedule along with special workshops. We believe that dance is at its core a performing art, so all students are offered several opportunities throughout the year to perform and display their accomplishments. In addition, PMA is delighted to have Metro Dancers in residence with its full performance season, including repertory concerts and full-length ballets. All group dance classes run from Sept. 4, 2018-June 14, 2019. Enrollments are taken year-round. Please click the links below or scroll down to see listings of our current dance offerings. We also offer supervised, arts-based childcare after school in our After-School Arts Club, with van transportation available to pick students up from area schools. This is a great way for busy and working parents to get their kids to after-school arts classes. CLICK HERE to see more about the Arts Club. Class tuition can be paid in a single; two or 10 equal payments made September through June. Adult dance classes run year-round with tuition paid in a single, two or 12 equal payments. The amounts listed below reflect the equal payment option. CLICK HERE for full tuition payment options. All Level 1 classes are open to age appropriate students with little or no previous dance training. Prior experience and instructor's consent required for Levels 2 through Advanced. New students should contact our office for proper placement, prior to registration. Parents are invited to observe classes during scheduled visitor weeks. All our dance studios have sprung wood floors and are fully air conditioned. Classes listed below may not be available every season. Please check the class schedule for current offerings. Contact us if you have a suggestion for a specific class. We frequently add new classes to our schedule. If you are interested in registering for a WAITLIST ONLY class, please contact our office for more information. If the blue Register button is not available next to a class, that class is full. Please contact our office about space availability. An independent dance and movement experience that helps children develop into confident movers that feel good about themselves. Self-esteem for children this age is primarily based on being a comfortable and confident mover. Kids love to get moving to music in activities that work on motor co-ordination, rhythm, and strength. A wonderful basis for all dance forms, sports and other physical activities. Tuition listed below reflects the equal payment option. Ballet technique is the foundation for all other dance forms and excellent preparation for sports, conditioning and other physical activities. 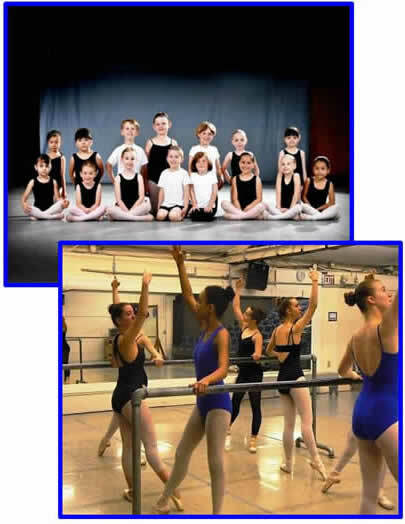 Classical Ballet is offered in a progressive program. Dancers working en pointe must regularly attend at least three technique classes per week. Tuition listed below reflects the equal payment option. As part of the urban culture of rap music, hip hop dance embraces several dance styles such as the athleticism of break dance and fast sharp moves of body popping. Hip hop and its music have become part of our popular culture and continues to evolve. Tuition listed below reflects the equal payment option. Dance in the footsteps of the greats. Tap dance is a fun and excellent way to develop a sense of rhythm and body coordination. The fundamentals of tap are taught in a progressive program of classes. Tuition listed below reflects the equal payment option.